I don’t test a lot of flip-front helmets. That’s because I personally don’t like them, and that means pretty much every one I do try out I’m going to give a poor review. I don’t like that they are heavy, awkwardly balanced and noisy. I also don’t really understand what advantages they offer over a full-face helmet. But I have to constantly remind myself—just because I don’t see the value in a product doesn’t mean a product has no value. Glasses-wearers prize flip-up lids, as do riders who need to wear a helmet all day—touring riders, motorcycle escorts and other professionals come to mind. I’ll wear flip-ups, so I can write intelligently about them, but I subject them to the same standards I expect from full-facers. That was the case when I tried the Vemar Jiano a while back. It was well-made and functioned as advertised, but it was just too drafty, too awkward, too uncomfortable. So when Motonation—importer of Vemar as well as AGV apparel and Sidi boots—told me it was offering a new version called the Jiano TC, I asked if it was better than the old Jiano. I was told it was indeed much better. So here I am, reviewing it. In fact, it’s a pretty good helmet, flip-front or otherwise. 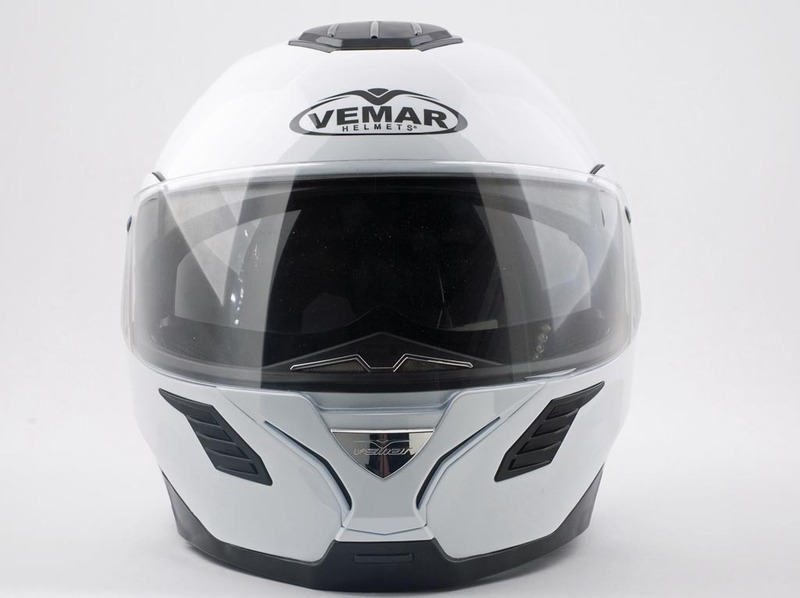 The outer shell (which comes in two different sizes to cover the 6 helmet sizes, XS-XXL) is a Kevlar/carbon/fiberglass composite, reshaped for better aerodynamics. The front of the helmet unlocks with a single button and uses metal pins and hooks to help keep the face shield secure in case of an unfortunate event (the original Jiano stayed locked in 97 percent of impacts during testing under the U.K. SHARP system). Inside, a removable lining and cheek pads allow the wearer to customize fit. A retracting sun visor is controlled with a sliding lever on the left side of the helmet. The inner liner is dual-density foam and the chinstrap is a very practical quick-release mechanism. The Jiano TC is a stylish and well-made piece of gear. The finish is good and the fit, finish and attention to detail are noticeable. 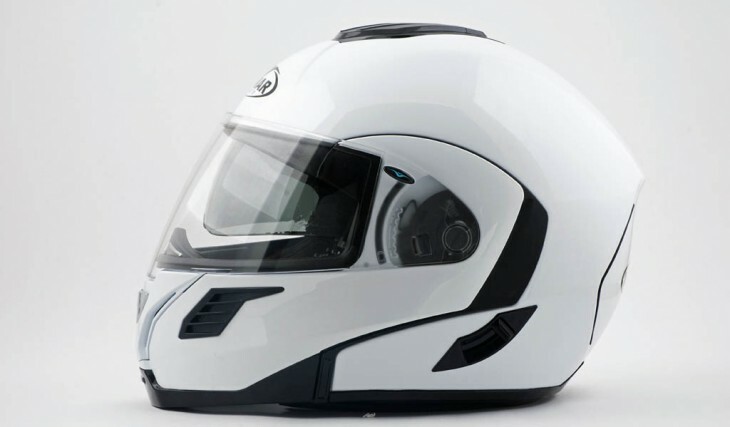 You won’t mistake it for a higher-priced helmet, but it’s also no cheapie. All the controls and levers work well enough, and the main latch is particularly satisfying to use, as it closes easily with an audible click—no worries about it popping open when you thought it was locked. The sheild-release mechanism feels cheap, but is very intuitive and easy to use. And I challenge you to find a larger vent than the manhole-cover-like thing on the crown of the TC. My matte-black Jiano TC fit me pretty well. MotoNation calls it a “mid-oval” shape, and I felt some pressure on the crown of my head, but it broke in within 50 miles. I was disappointed with the weight—Jiano claims it’s under four pounds, but my postage scale read four pounds, one ounce, and you really feel the weight (it’s about 12 ounces heavier than my usual favorite, the HJC RPS-10. Chalk it up to the flip-up stuff and internal shield mechanism, and anyway, most flip-ups are pretty hefty, which may be why touring riders often have thick necks. On the road, the Jiano TC didn’t really feel like a flip-up helmet to me. That’s because it’s the quietest and least drafty flip-front I can remember testing. No whistling noises, no breezes tickling my face. The visor seals well and is distortion-free (it’s claimed anti-fog, but it works as well as the other “anti-fog” faceshields I’ve tested). The internal sunscreen is good. It’s easy to deploy and retract and offers a variety of positions to even accommodate guys like my cousin David, who has a large (but very handsome) nose. The visor isn’t tinted enough to ride with directly into the sun, but it beats sunglasses—or having to carry an extra shield for when the sun goes down. There is no question that it offers a lot of features for $375. Vemar now has a flip-front helmet I would strongly consider if I was looking for the convenience and flexibility these lids offer. It’s available in four colors (matte black or glossy silver, white or black) and a Bluetooth-equipped version ($595) at retailers or through MotoNation’s website. I like the internal sun visor system, have one on my HJC, much better than sunglasses. The only problem I see is the controls are on the left, along with the main visor lifting edge. (Most companies do this). For me that means I must make the adjustments on the move, just in case I can’t get the bike into neutral at a light or other stop. So how about making all main visors with lifting edges on both sides and the sun visor in the middle (HJC style) or both sides? +1 on the HJC RPS10. I love mine. Been wearing modular helmets for about ten years. Had several Nolans, and HJCs, a KBC and currently wearing a Shoei Multitech. Earplugs are a must, but I think they are regardless of what hat you wear. Tough to argue the convenience factor when glasses are necessary. Nice to converse with a toll gate attendant while fumbling for change. Easier to chat with the State Trooper who “noticed” you. I believe that in some cases, the extra hardware and what not attendant to the operation of the chin bar is actually structurally stiffer than a regular full face. The flexibility of the main shell is also safer, reducing the G’s allowed to pass through to the riders melon were he or she to hit the pavement. Remember the article in Motorcyclist Magazine called “Blowing the Lid Off?” Excellent. A plastic helmet allowed the lowest G forces in testing, due to it’s flexibility. A company called NAVA made plastic helmets years ago, and claimed the safety to be superior for the same reason. They also had a cool faceshield that stayed open about a half inch all around the eyeport, and closed automatically from wind pressure at 60MPH. I’ll keep on wearing the modulars. You are assuming that everyone who buys a flip up is an idiot who thinks there is the same level of protection with a flip up as a full face. Probably 95% of riders who buy them know they are less safe. Yet, somehow, despite not having as much wisdom as you, they exercise their free will to buy as they choose. If you want to be as safe as possible then why even ride? Anyone on a bike who has a “false sense of security” on a bike IS an idiot-especially those who are geared up to the teeth and ride around in a cloud of “smug”. Flip up will not take a chin or jaw crash, is heavier and drastically structurally wealer than a full face. Only avantage is you can chit chat when you pop in for gas. Who cares about that, take your helmet off and give your head a rest and skin a chance to breathe. Or how bout just shut up and “ride hard”? If you do that I guarantee you won’t bother with one of these gimmicky and dangerous toys. These things are about as usefull as handlebar tassles and 100* more dangerous as they lul a rider into a false sense of security. Why all the concern about peripheral vision? I don’t feel that’s a limitation with my full face at all. My neck swivels, so I swivel it and can see whatever I need to see. Small mammals don’t wear helmets, but keep a good lookout for predators. On the road, we are those small mammals. Turn your head, and no matter what helmet you wear, you’ll be better off. I am 71 and have been riding since I was 14; let see that’s 54 years. I always wear a helmet, but never a full face one. I did have one once; however, since I need my glasses to see, a fast way to ruin them is to try to get them under a full face helmet’s shield. Also, ones field of vision is greatly compromised in a full face helmet, and real world SAFE riding requires being able to see all around. In my 54 years of ridding I have only needed the protection of a helmet once. I think my being able to see has a lot to do with that. A helmet is great, but it is better to have never needed it. Hey Nor, I am afraid I don’t understand the comment. You say you don’t wear a full face, do you wear an open face, a flip front, or none at all? BTW I am 43 and have been riding since I was 18, I guess that makes it around 25 years. On my first bike I had a highside and landed on my face at somewhere around 50 mph. I was wearing a cheap Italian Bieffe full face and from the looks of it the helmet did its job. I haven’t worn anything but a full face or flip front since. My father in law, on the other hand (who is also 71) refuses to wear anything but an open face on his Goldwing (along with loafers and a members only jacket). I don’t understand the anti-fog comment. Does the anti-fog shield work or not? I’ve got two different helmets w. OEM anti-fog. One is a dismal failure and the other (Scorpion) is 100% effective. I’ve ridden (even raced) in Scorpion helmets in sub-40f temps, and I’ve worn them in over-100f/90% humidity heat, and I’ve never seen any fog, ever. I’m asking because I’m in the market for a flip-up, and now that I’m spoiled by the anti-fog of the Scorpion lids, I won’t settle. I found the faceshield fogged up about the same (maybe a little less) as a non-treated faceshield. It’s no substitute for something like a pinlock visor. I’ve never tried the Scorpion visors. Just being able to comfortable sip a camelback, talk to a friend so they can hear you, and the ability to cool off without removing your lid is impossible for me to resist. They probably are louder, but I always ride with earplugs so wouldn’t really notice. Have worn Nolan helmets for at least 15 years, and unfortunately had a deer jump a fence and hit the lower front end of my bike on the fly while I was going about 65 last August. I might have been better protected in a full face helment, but I slid down the rural highway, scraped the hell out of the side of the helmet (1/3″ or so scraped away), and the lid stayed closed. Not a scientific test, but reassuring for me. Got up, strapped all the gear that had yard saled behind me back on the bike, and rode the 550 miles home. Nolans do very well in the SHARP testing, staying latched 100% of the time. Better than some other more expensive brands. HOWEVER, just staying latched doesn’t mean you have the same integrity and impact-absorption of a real full-face helmet. That is the best line I have seen about a bike crash ever! Glad you came out of it OK and could share it. I have both a Nolan flipper that I’ve had for several years and a full face carbon fiber helmet that I bough a year ago. I bought the full-face to replace the Nolan (finish is starting to flake and the padding is losing its “cush” factor), and I had decided to go with a good full face for better protection. Problem is, I still wear the Nolan much more often. The ability to flip up the lid to scratch a nose, talk to someone, easily wear sunglasses instead of keeping an extra visor, cool-off, etc. has really spoiled me. I ride a naked bike (with earplugs), so I can’t really say I notice the full-face being quieter. The Nolan is significantly heavier, but I find that my neck is much less stressed. My head can shake pretty frantically at high speed or in thick, fast moving traffic when wearing the lighter full-face. I guess the extra mass of the flipper dampens the turbulent buffeting effects, and my neck muscles are working much less to keep my head straight. You’ll probably the the full-face on ebay soon. I’ve been a flip front wearer for almost 3 decades. I’d agree on some points about noise & weight. I’ve never spent much time on a faired bike, so every helmet is noisy flip fronts moreso. Weigh is the price of wearing a helmet. Ask the loud pipes save lives gang, they swear helmets break their necks. I’m still shopping for a quiet flip front, probably not such a critter. Ear plugs have been the norm for a long time. I wish I was a candidate for Lasik surgery, but it’s not compatible to my eyes, until then flip fronts it is. You don’t understand the advantages of a flip up helmet? temperatures that range from 90 to 110F. Being able to flip up the front at stops is a welcome treat. I understand the advantages. I just don’t like riding in less than a full-face helmet. Examine the results on the SHARPS website and you’ll understand that a flip-up helmet only gives the illusion of full-face protection. I think it might havve been the part where you said “I also don’t really understand what advantages they offer over a full-face helmet” that led him to believe that you didn’t really understand what advantages they offer over a full-face helmet. True enough! Sorry about the confusion, Sam. Two-piece (flip-up) helmet benefits??? How about spitting at will, blowing yer nose, catching that occasional sneeze before it catches you and makes a mess of the INSIDE of your helmet, talking (audibly) to your mates at a stop sign/traffic light, increased peripheral vision entering/exiting gas stations after fill-ups and momemtary “cool downs” without removing your lid just to name a few benefits. I’ve owned nearly every Shoei ever made including my present Multi-Tech which is as quiet and light as any full-face (except full carbon-construction race helmets, I suppose). 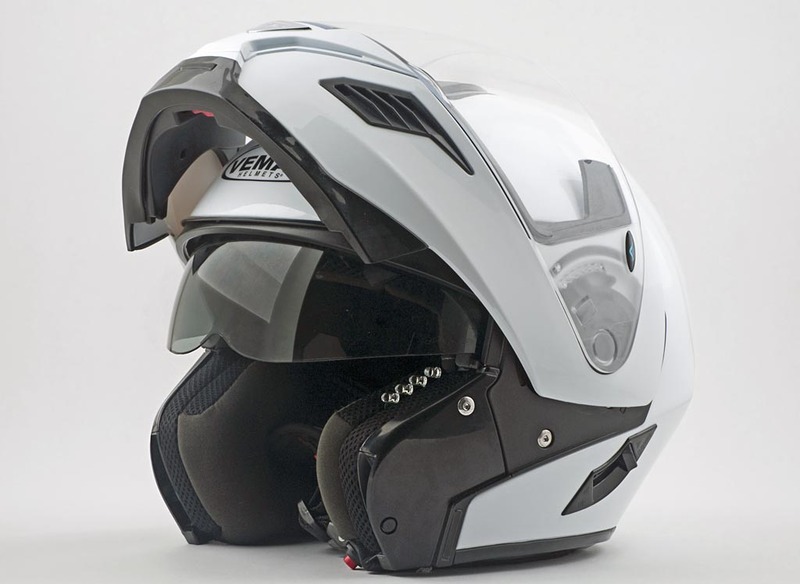 I would put the Multi-Tech up against any helmet (although I haven’t demoed Schuberth’s new C3 yet). I sold my Shoei X-11 because I just didn’t wear it anymore.